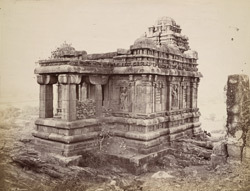 Photograph of the Malegitti Shivalaya Temple Badami, taken by Henry Cousens in the 1880s. Badami, formerly known as Vatapi, was the capital of the Early Chalukya rulers in the 6th - 8th centuries and is situated in modern day Karnataka. Two hills of red sandstone separated by an artificial lake, dominate the town, both of which are topped with a later fort. Cut into the hill immediately below the south fort, there are four shrines which Badami has become famous for. On the opposite side of the town, below and around the north fort, there are a number of structural temples. The Malegitti Shivalaya Temple, built around six hundred by the Chalukya dynasty, stands on a massive red sandstone boulder, towards the north of Badami. The temple is formed of a sanctuary, a square columned hall and an entrance porch . The base is richly carved with friezes of mythical animals in a southern or Dravidian style. The outer pilastered walls of the hall have sculpture panels in the projections depicting images of Shiva and Vishnu that, unusually, have moustaches. Pierced stone windows in the recesses of the walls are surmounted by foliated makaras, aquatic monsters. The multi-storey roof over the sanctuary has an octagonal dome and is decorated by miniature edifices and kudu or arch motifs. The sanctuary itself is home to a large linga.